Story Blurb: It’s 1886, and Chicago is booming, but for nineteen-year-old Torsten Pilkvist, American-born son of Swedish immigrants, it’s not big enough. After tragically losing a rare love, Tory immerses himself in the pages of a Wild West mail-order bride magazine, where he stumbles on the advertisement of frontiersman and Civil War veteran Franklin Ausmus. Torsten and Franklin begin an innocent correspondence—or as innocent as it can be, considering Torsten keeps his true gender hidden. But when his parents discover the letters, Tory is forced out on his own. With nowhere else to go, he boards a train for the Black Hills and Franklin’s homestead, Moonlight Gulch. 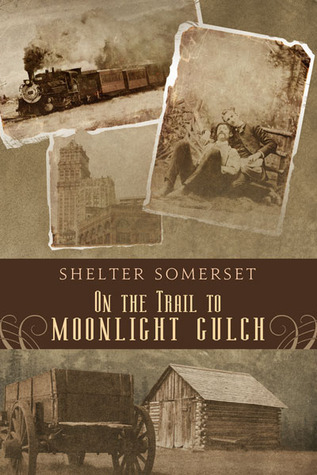 I’m a great fan of classic western tales, especially if they are accurately portrayed regarding setting and lifestyle, and in my opinion On the Trail to Moonlight Gulch, by Shelter Somerset [Dreamspinner Press, 2012] touches most of the right bases. The story is about a lonely, tenderfoot Easterner, Torsten Pilkvist [I love the names], who naively starts a lovelorn correspondence, as a woman, with an equally lonely rancher, Franklin Ausmus, and when Torsten is forced to leave home he impetuously makes his way west to find him. As improbable as this may seem, it nonetheless works because Somerset has done a superb job of bringing the loneliness of these two characters to life, and since we’ve all “been there,” so to speak, it is easy for us to empathize with them—i.e. the litmus test of a good writer. Thinking Torsten is a drifter, Ausmus takes him on as a ranch hand, but Thorsten chickens out on telling Frank he is the ‘gal’ he has been writing to—setting up a conflict of significant proportions later on. Of course, no good western would be complete without villains, and there are a whole cast of them in this story. The ring leader is a French Canadian by the name of Henri Bilodeaux who, along with others, covets the gold that still remains on Ausmus’ property. The writing is solid from start to finish, and the descriptions are not only vivid but also informative at times. Somerset has done his research well, and it shows. For the most part the characterization is also done well. The good guys are principled but ‘human,’ which makes them all the more credible, and the bad guys are definitely bad. The author has also given Torsten a reasonable period of adjustment to fit into the role of ranch hand, rather than thrusting him into it as many writers do. The other supporting characters, Wicasha the Indian and Madame Lafourchette, are a bit formulaic but nonetheless charming—almost de rigueur in a classic-style western of this sort. Altogether, this is a delightful read for all those who like their westerns ‘classic.’ Four solid bees. 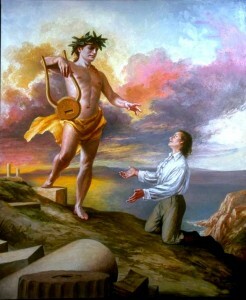 It might seem odd for a western-themed story to have a mythological element to it, but in addition to the appearance of the Sasquatch, it also has an underlying role for the Greek God Apollo, god of light and the sun, truth and prophecy, healing, plague, music, poetry, and more. Until you be united again for all eternity. Thanks for dropping by! Your participation is what I work for.